We had the chance to spend the morning with third graders from Creekside Elementary School today, discussing the merits of worms and compost, the fine art of mixing potting soil, and the importance of good soil stewardship. This was part of a field trip series has been organized by Black Hills State University Sustainability Coordinator, Katie Greer, and Spearfish Local intern, Jessie Clark. While we visited in the greenhouse, Jessie led the students in a ecosystem services web exercise in the garlic shed, illustrating just how intricately interconnected and interdependent everything is. Here are a few photos from our morning in the greenhouse. 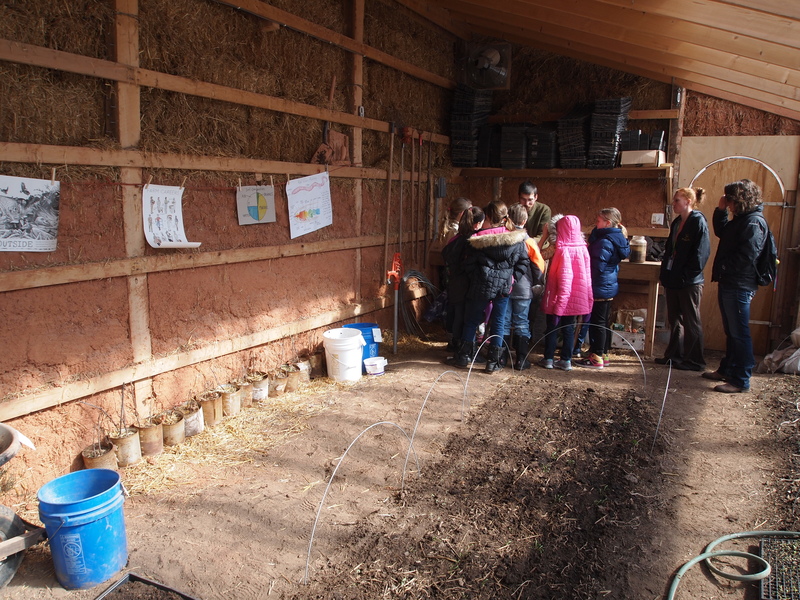 Today was part two of a three-part series of farm tours for the third grade class at Creekside. In total we’ll have a chance to host 180(ish) students, for fall, winter (today), and spring trips. By coming out to the farm during this time, the students are getting a chance to peek in at the inner workings of the farm – more than just the display at the Farmers Market table. There is so much that happens on a farm throughout the seasons, these trips are hopefully building a deeper connection to the local food system. A 1/3 of the class (60 students) came in November and helped us winnow seeds. We talked about the advantages of saving our own seed, regionally adapted varieties, selecting for taste, plant strength and vigor. We investigated different seed shapes and dispersal mechanisms. Observed how calendula seeds look just like a cartoon hedgehog, (pokemon? I can’t remember). And a BHSU student, Evan, led the kids in a local foods relay, comparing food miles for different types of grocery items. After each group visits, they return to school and put together a presentation for their classmates; they share what’s happening on the farm, what they learned. The spring trip will be in April(ish), we’re looking forward to it. 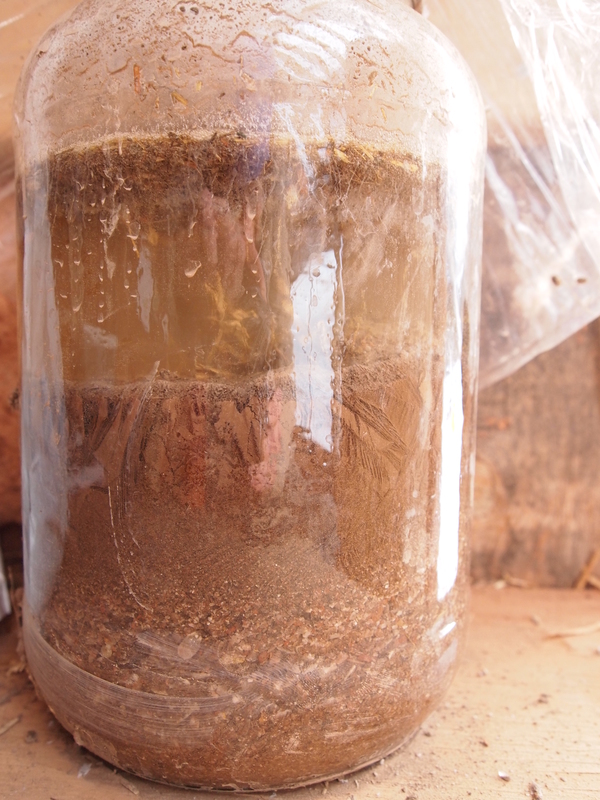 The no-hesitation, dive-right-in approach to vermiculture is absolutely the best thing ever. Big, muddy high-fives, you guys, we appreciate your enthusiasm for castings. Figuring out which end is the mouth-end was routinely important throughout the morning groups (I suppose it’s always good practice to know which end to address). And finding worm eggs was pretty exciting too. 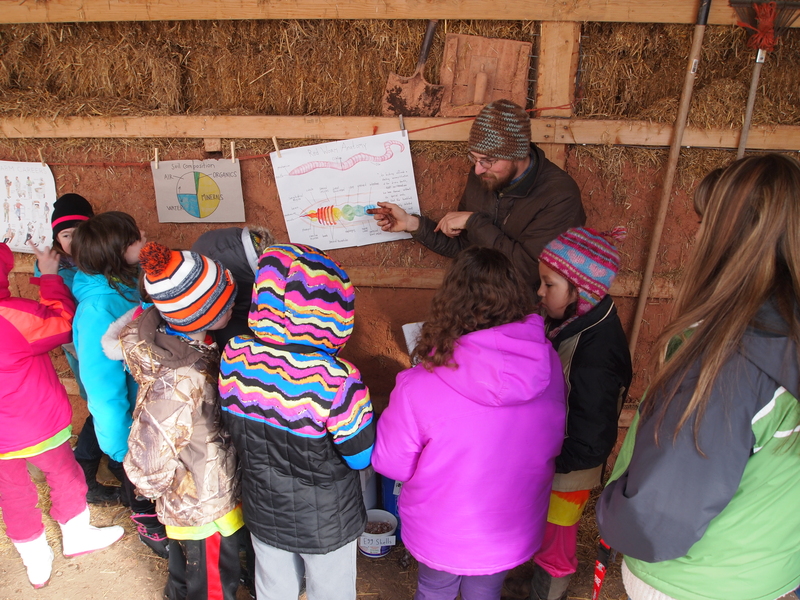 We were so happy to see these kids understand the link between healthy food and the farms and soils that produce it. Thanks for spending the morning with us!